My last family trip was to Finland, in 2006. Yes, that was nearly 10 years ago. It’s no wonder my mum commented that we’ve not been on a family vacation for way too long. This was during a time when I was still enjoying the perks of being an SIA Brat. My mum really wanted to visit the Santa Claus Village and mail postcards back home from the post office there. 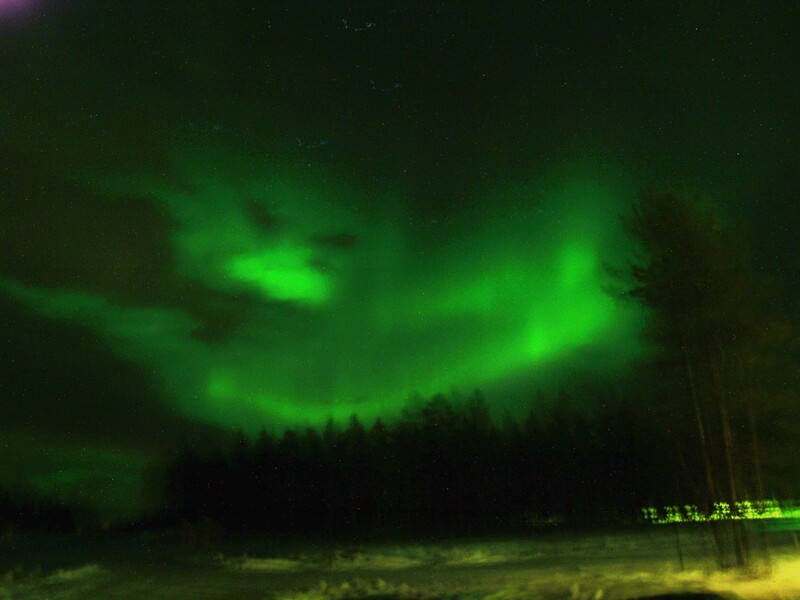 And of course, when in Lapland, one must attempt to catch a glimpse of the Northern Lights. We waited in the cold, hoping that this would not be a wasted trip as we were on tour and there was no guarantee that we’d get the chance to see the Aurora. I was so mesmerized by the sight before me that I just stood still, watching the green neon rays dancing above me. Unwilling to take my eyes away from it. Even for just a second. I was so engrossed in the natural light display that I forgot to take a photograph of this breathtaking phenomenon. Fortunately not everyone was so foolish. The photograph above was taken by a fellow tour group member who has kindly sent it to us. Yes, its blury. But without a tripod, that’s totally understandable. Unfortunately, this was so long ago I cannot remember his or her name. Whoever you are. Thank you. This is proof that it was no dream. I did indeed see the Northern Lights with my very own eyes. Since I don’t have a really nice photograph of the Aurora, I searched Instagram for photographs instead. Looking at these amazing photographs fills me with regret. Regret that I wasn’t prepared and didn’t make the most of the opportunity to capture some great memories as a keepsake. Next time I travel to catch the Aurora, I’ll be better prepared. This shot is gorgeous! Look at the array of colours in that sky! Seeing the Aurora Borealis in Iceland is definitely on my list of things to do there! I was in Norway during summer and was bundle up in a warm wooly jacket while everyone was wearing thin t-shirts and shorts. Wondering if I’d survive a Norwegian winter… But for the Aurora Borealis, I’d brave it. Alaska is also on my list of places to visit. Don’t you think the Aurora looks like river of lights in the sky? Cool eh? This is one of my favourite shots found on Instagram. I love looking up and I love that this ‘look up’ shot gave us a different view of the Aurora and managed to capture a shooting star at the same time. Score! I feel as if God took a paintbrush, dipped it in green luminescent paint and swirled his brush over the night sky. Look at those colours! Like a rainbow raining down onto Earth. I love the reflection of the Aurora in this shot. The symmetry draws me to this photograph. I’m greedy. I so wish I managed to catch a multi coloured Aurora like this one. Love the way this photograph was framed. I’ve loving the low angle shot of the Aurora more and more. Note to self, attempt such a shot the next time I see an Aurora. For some reason this photograph reminds me of the animated feature film Rainbow Brite and the Star Stealer. Probably because Rainbow Brite would ride her magical horse, Starlite across the sky on a rainbow. This is a beautiful shot of the Aurora! I might never be able to see this with my own eyes. But I would love to if I had the chance and the means to. I have to admit. This image made the list because I’m currently crazy about the TV series Outlander in which a woman from 1945 travels back in time to 1743 when she touches a standing stone in Scotland. These stones coupled with the Aurora caught my attention. Pink! Purple! Pink! Purple! Can’t decide like Sleeping Beauty’s three fairy godmothers? Just mix it all up and you get this. #Iceland. #Planet Earth. #HomeSweetHome Happy #EarthDay everyone. Even though its only one day a year, my appreciation for our gem of a planet goes 365 days a year. #northernlights #auroraborealis And check out @earthpix for some truly amazing photos of #landscapes, #creatures and everything else that makes our planet so extraordinary. In a recent post I featured a Instagram photograph of Seljalandsfoss, in Iceland. This looks exactly like it. It’s probably easier to capture a shot of a rainbow, but the rainbow colours of an Aurora display is so much prettier! The sun and the Aurora in one shot! Of course this is on my list. Enough with the colours I say. Even this white Aurora dancing across the night sky looks gorgeous. Luminescent rain over the city of Mo i Rana in Norway. In the north, the Northern Lights are called Aurora Borealis. In the south, you’d be catching the Aurora Australis, also known as the Southern Lights. The Aurora Australis don’t occur as often though. The beautiful Aurora display is caused by cosmic rays, solar wind and magnetosphere plasma interacting with the upper atmosphere. The most common colours of the Aurora is green. Then red or pink. Purple and blue appear only at the highest levels of solar activity. For a good chance of catching an Aurora display, you’d need to be in the auroral zones, darkness, clear skies, and an active sun. But catching the Aurora is still a hit and miss thing. So my suggestion is to consult a professional – go on a Northern Lights tour and pray for all the right conditions. And you just might get lucky. Have you seen an Aurora before? What was your experience like? Where did you manage to catch this stunning natural light display? Do you know where is the best spot to take amazing photographs of the Aurora? If you have any other tips on where to catch the Aurora or how to capture it on camera, please do share it with us. Wow indeed. The Aurora Borealis is truly a magnificent sight to behold. Great pictures ! I had the chance to see the Aurorea Borealis in Norway 2 years ago. It is magic ! Magic, aptly put. Thanks for liking my post. The photos aren’t mine. But I’m grateful to those who took the photos cos I get to relive the moment through their photos. I’ve only seen them a few times and always been totally wowed! So gorgeous! I’ve been to Finnish Lapland – at the wrong time of year. This year I’m going to Iceland – at the wrong time of year. I feel destined to never see them! But ONE DAY! Around what time did you happen to see these phenomenon? And for how long does it last? I am curious to know so that when I plan for it, I am ready with sufficient time in hand. It was quite some time back, but I think it was late, about 11 plus close to midnight when the Aurora decided to grace us with its presence. It lasted for quite a while. Can’t remember for how long, but it was still dancing away when we left. It was part of a group tour so there was only a short window of opportunity to catch it. I was VERY lucky. My advice, choose a tour that has very experienced Aurora chaser guides. Excellent photos. I can understand that your friends photo got blurry: it’s an impossible task to hold a camera still for that long. Yeap. Now that I know better, I will lug a tripod with me no matter how chunky and bring my DSLR. Those are some incredible photos, thanks so much for putting them all together. One of the absolute top things on my bucket list. Those are absolutely amazing photographs.